This article will explain how AI can help you get better hiring results (AI Benchmarking Engine for the win, but more on that later!). How to enable the AI Benchmarking Engine? Let us first look at the definitions of Artificial Intelligence. Artificial Intelligence is the ability of machines to perform human tasks. The term “is applied when a machine mimics “cognitive functions that humans associate with other human minds.” These include learning and problem-solving. Machine Learning” is a field of artificial intelligence that uses statistical techniques to give computer systems the ability to learn (e.g., progressively improve performance on a specific task) from data, without being explicitly programmed.” It is closely related to computational statistics. Deep learning ” is part of a broader family of machine learning methods based on learning data representations, as opposed to task-specific algorithms.” The process of learning can be supervised, semi-supervised, or unsupervised. It can be used in speech recognition, social network filtering, computer vision, and board game programs. AI works either with humans in the loop or without them. Every hiring decision you make can help you advance your product as well as sink it. Choose the right person, you take a step forward. Choose the wrong one, you take a step back. The cost of hiring the wrong developer can reach $485,371.38 so that’s one very expensive step. We’ve recently released a new Devskiller feature based on machine learning. Ladies and gentlemen, I present you the AI Benchmarking Engine. It allows you to predict your candidates’ chances of success. We also compare your candidates’ parameters with market benchmarks generated by our platform globally. By doing so, we can give you a clear indication of the quality of your candidates. The algorithm determines if your candidate will be successful with 85% accuracy. Success must be predicted against a trusted measure. To start using the AI Benchmarking Engine, you need to mark 50 candidates as “Accepted” or “Rejected” in your dashboard. Based on your choices, the algorithm uses your data to give you even more accurate results. What is more, your candidates’ assessments are compared with our global platform parameters for even better results. The feature is available on request to Devskiller Enterprise users. To switch it on, contact your account manager. You can also email us at hello@devskiller.com. 74% of employers admit to having hired the wrong candidate. Don’t make that mistake. Recruiters spend a lot of time sourcing, sending emails, conducting interviews, and updating candidates. According to Ideal, 14 hours a week are devoted to manually completing tasks. While the human touch is the main part of the Human Resources package, some repetitive activities can be automated. This increases productivity and the quality of interaction with candidates. It also helps eliminate errors, boosts your speed, and improves quality of work. It takes on average 40.8 days to recruit a software developer. Developers are typically inundated with job offers. You need to act fast before others do. Some companies are already using chatbots to improve the candidate journey. For example, Sutherland designed an omnichannel bot named Tasha. It helps navigate the recruitment process and provides candidates with basic information. It also suggests positions which would suit their skills. At one point in their candidate journey, a staggering 80% of people dropped off. That’s mostly due to the lack of information they needed to move forward. Recruiters need quick, informative ways of getting insights into their candidates’ skills. AI-powered HR tools can definitely highlight better talent. Another way is to use benchmarks to see how your candidates are performing when compared to a larger sample. Many recruitment decisions are based on gut feeling. When screening technical skills, algorithmic assessments focus on the skills of the candidate and nothing else. This fosters diversity in the workplace. A cognitive system must learn what a good candidate is like and what skills they possess. This means you need to have some data to feed it first. Not all activities can be automated. Automating structured tasks allows you to focus on activities requiring human interaction. Being more present and well-prepared for an interview is one example of this benefit. Using pattern recognition to surveying employees allows you to identify attrition risk and take measures to prevent it. One of the ways of doing that is to look at employee survey scores. According to SAP, “Talent flow modeling involves using mathematical algorithms to understand and predict workforce changes associated with the job status of employees.” The data measures when and how often people are hired, promoted, transferred, and how often they quit. Artificial intelligence and the human touch shouldn’t be mutually exclusive. Is AI going to take over recruitment? Should you be worried about your job? Not really. Industry leaders realize that AI is most effective when it complements humans and not replaces them. As the recruitment landscape changes, it will require a new set of workforce skills. According to Deloitte, most people understand what these skills are. That said, 49% don’t have plan a to cultivate them. Using artificial intelligence in tech comes with its challenges, including data security. Despite these challenges, the upside is immense. As AI in HR gets smarter based on the data it receives, you can expect it to remove a major impediment in your productivity. Another benefit is that you’ll likely see an improvement in the accuracy of your hiring decisions. Is AI a thing of the future? Not quite. 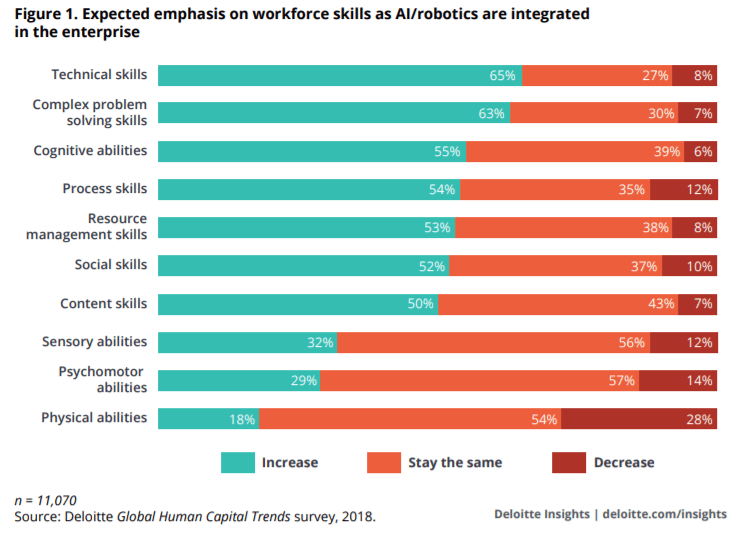 According to the 2018 Deloitte Global Human Capital Trends, “61 percent of (…) survey respondents told us they are actively redesigning jobs around artificial intelligence (AI), robotics, and new business models (…). 42 percent believe automation will have a major impact on job roles over the next two years.” AI in HR is happening. It will take us time to get its full potential, but there are already things you can do now to get immediate results.